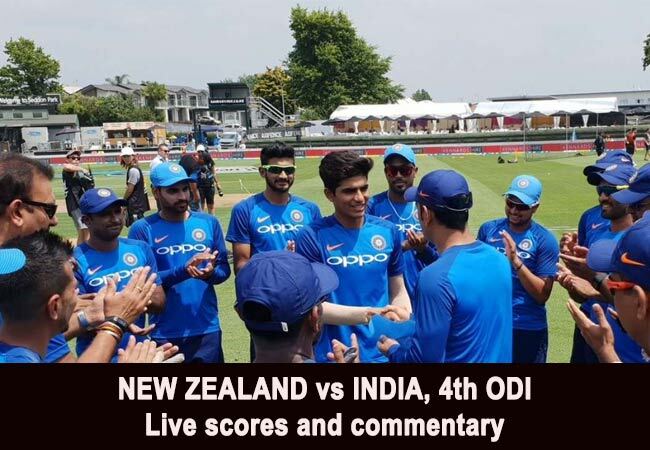 INDvNZ, 4th ODI:: India take on New Zealand in the fourth ODI at Hamilton on Thursday. Having won the series 3-0 already, the final two matches are a mere formality and the visitors will be without their skipper Virat Kohli, who has been given the much-deserved rest. IN his absence, Rohit Sharma will take the charge. Rohit will be eager to make his 200th appearance for India a memorable one with a solid performance against a below-par New Zealand on Thursday. Rohit has a good record as stand-in captain and has three double hundreds in ODIs to his credit, would aim to tighten the noose around New Zealand in what could be another batting friendly track at Seddon Park. Pretty close to the World Cup, New Zealand showed they were not fixed on the idea of Colin Munro opening the innings. After they won the toss and decided to field – hoping for some dew to help their chase later – Kane Williamson announced that Munro had been dropped and Henry Nicholls was set to move up the order. Both James Neesham and Todd Astle walked into the XI. Lockie Ferguson was left out for Matt Henry. Colin de Grandhomme came back too. In the other camp, MS Dhoni was not yet fit, but he handed over a new cap to arguably one of the most exciting debutants in recent times. Shubhman Gill, according to the resting Virat Kohli 10 times more talented than him at the age of 19, became India’s newest cricketer, taking Kohli’s place in the line-up. India also rested Mohammed Shami to bring Khaleel Ahmed in.